We´d like to invite everybody interested in innovative and quantitative methods for continental palaeoenvironmental reconstructions to submit abstracts for our session (details below) at the General Assembly of the European Geosciences Union, 8-13 April 2018. We hope you will enjoy this session. A very active southern hemisphere team! At the end of November, Beth and Cinthya had a very fruitful time while participating at the annual conference 2017 of the Geoscience Society of New Zealand, presenting preliminary findings of speleothem magnetism and cave monitoring in and around Waipuna cave. 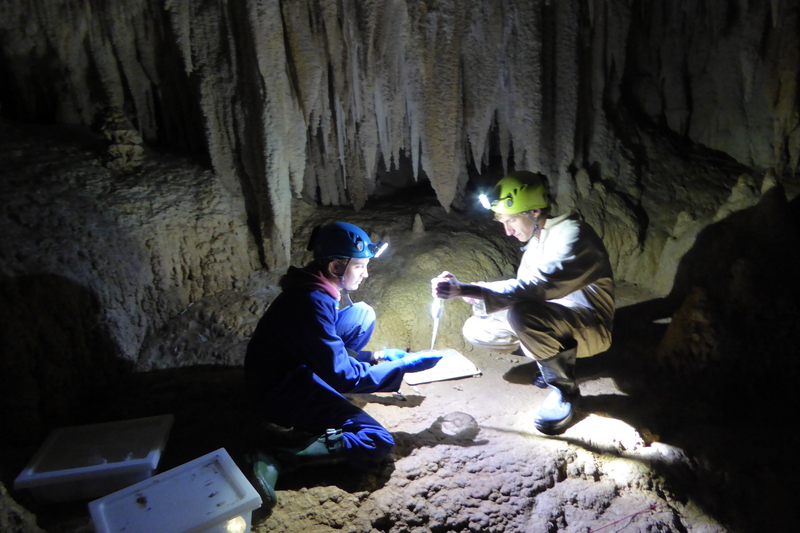 In the meantime, Adam, Inken, and Cinthya had an intense work in the field visiting Waipuna cave to carry out the SH summer monitoring collecting water samples from the drip points and taking measurements of the physicochemical properties. Additionally, the team installed the first sampling device for the analysis of cave organic aerosols, with the objective of characterizing the cave´s response to external conditions. After, 5 field trips and a lot of hours of intense work underground, the team returned home tired but very happy, with many samples and a bunch of data ready to be analyzed at the Waikato University, University of St Andrews, and Johannes Gutenberg-Universität laboratories. Now, all of us are looking forward to the next adventure.